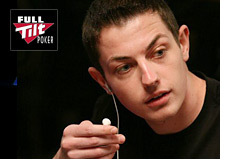 Is Tom Dwan becoming red? Every Full Tilt Poker Pro is shown in red letters and this might happen to Mr. Durrr pretty soon. Of course these are only speculations but rumors are spread that he could sign as Full Tilt Pro in the near future. Nobody knows why Tom Dwan doesn’t have a sponsor already. He’s one of the most popular and successful players and even unknown players can get a sponsor nowadays. But Durrr has none and the reason might be that he’s waiting for a very big deal. Maybe he doesn’t care if he gets 100 % rakeback at Full Tilt or if some of his live tournaments are getting paid. Maybe he’s looking for shares and a deal where he can earn millions. So it seems that it’s only a matter of time when Tom Dwan is becoming red. This entry was posted on Friday, August 28th, 2009 at 7:27 pm and is filed under Poker News. You can follow any responses to this entry through the RSS 2.0 feed. You can leave a response, or trackback from your own site.